In September we began a project to convert all of our old analog delivered cable television channels to new digitally delivered channels. The project is necessary because analog delivery is a dead technology, and we can no longer buy equipment that supports analog services. Time marches on, even in Glasgow. We put up a good fight to maintain our analog channels far beyond the time when all other cable systems had already abandoned analog transmission, but the time has come for us make this overdue transition. This post is an update on how the project has gone, and is still going. When we began informing customers of the upcoming analog shutdown through Facebook, the RBG Blog, Weather channel crawl, Cable 6 ads, "Analog Shutdown" screen put on random channels, and our website (the Glasgow Daily Times even helped us by running articles about the transition), we did not plan for the project to last this long. Actually, we planned to finish this by November 2. On Oct. 28 we turned off eight analog channels, Ch. 7-Ch.12, Ch. 21 & Ch. 22. Once these channels were shut down, our phones lit up and we began to really understand how many folks were not ready for the transition. Far fewer customers were ready than we had estimated. As a result, there was a mad rush for the DTA boxes necessary to adapt analog televisions to receive digital signals. With the help of every member of the EPB team, we installed approximately 1,100 DTAs from October 28 up to November 16. Though we said that we would turn the analog channels off on Nov. 2, once we realized how many customers needed the DTAs, we began altering our plans and rushed to change our schedules with the various programming vendors with which we do business. By November 16th we had the DTA install list down to under 40 customers. We turned off HGTV, FOOD, TRAVEL, & GAC (Great American Country). Surprisingly we had very few phone calls that day and only a couple that night. So, on Tuesday November 17 we decided to turn off 10 more analog channels, including everything above Ch. 65: Cartoon Network, ABC Family, E!, truTV, SyFy, History, FS1, FXX, CSpan, CSpan2. Once again, our phones and our Facebook page lit up and we were shocked to learn how many customers still were not prepared for the transition. So, we ordered even more DTAs and began installing and issuing them. We have now pushed out 1,300 DTAs to quench the demand. The last 100 ordered, arrived this morning and will be depleted through next Thursday's DTA schedule, so we are ordering 100 more. This is triple the number of DTAs that we estimated we would need! We are very sorry for all of the confusion and frustration this project has caused, but we know the network will deliver superior services as soon as we can complete the construction work associated with this transition. All analog channels will be turned off by January 2 2016. So anyone wanting a new television for Christmas or looking for a Black Friday deal, make sure you are getting a television that supports Digital QAM tuner. This will keep you from needing a DTA. After that, all the remaining digital services will be reorganized by Feb. 18, 2016 to accommodate dramatic new services for our customers. We know that you, like us, are very anxious for that to happen! So, that is where we are on this long and complicated project. We thank you all for your patience as we work through this drastic improvement to Glasgow's network. October worked out very well at my house relative to my energy usage and peak demand under the rates that will be in effect next year. 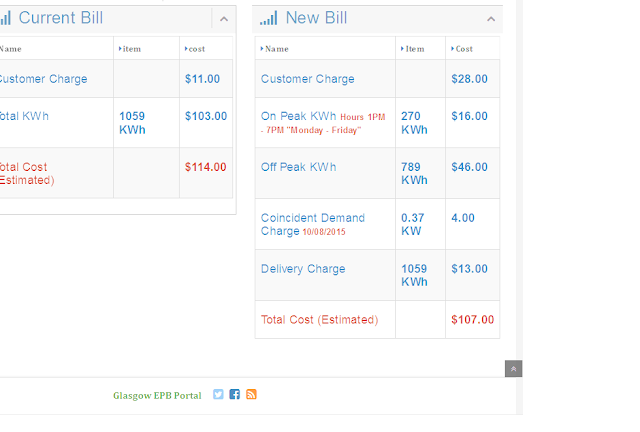 Using the "New Bill" feature of our Infotricity Energy Portal (as you can see above), my bill under the new rates would be $7.00 lower than it is under our existing rates! In October Glasgow set it highest hourly demand on October 8 at 2:00 in the afternoon. Your EPB team predicted that afternoon as a possible monthly peak (and making that prediction so early in the month is very tough) so I raised the setting on my air conditioning for the afternoon and also put off any other significant electric power consumption until after 4:00 pm. That is all I did. It did not require any expensive technology nor did it take large changes in the way my home operates. I moved my thermostat set temperature from 75 up to 80 for four hours. The result was a contribution to Glasgow's peak demand of only .37 kW and that is the reason why I would have saved $7.00 under the 2016 rate. We don't want to sound like a broken record about this, but if you are not monitoring your home's energy usage and using the bill comparison tool on your Infotricity Energy Portal at https://portal.glasgow-ky.com/ you are missing a great opportunity to practice changing your energy usage so that you can best adapt to the new rates which will go into effect on January 1 2016. But please be aware, if you use the comparison on the first few days of the month, it is going to look shocking. Since the Coincident Peak Demand resets at midnight on the first of each month, then each hour of the new month becomes the peak hour for the month. The result is that you will see some surprising Coincident Peak Demand numbers until the data settles and the weather causes a legitimate peak demand. Within the next few days, everyone will get a paper version of this comparison, just to make sure that everyone is informed of the coming rate change. This version of you bill will be marked clearly "DO NOT PAY" but it will offer comparison of your consumption for the month just ended as it would be billed under the 2016 rates. As you can see, these rates will be like nothing you have experienced before as they are unique in our nation. We are also launching a new website totally devoted to giving you more information about the new rates. You can visit it at www.infotricity.org where many of your questions and confusion about the new rates will be answered and straightened out. Very soon we will also launch our Infotricity Energy Channel on channel 2 of our cable system. The channel will add another way for you to learn more about your energy usage and ways to lower your electric bill. The new rates will precisely track each customer's use of energy as individual usage matches up to the wholesale rates we must pay TVA for the electric power we all enjoy. After January 1 there will be different rates for on-peak kWh and off-peak kWh during most months and, most importantly, there will be a coincident peak demand charge which represents each account's contribution to the maximum hourly peak for the month. These rates should begin to reshape the way energy is used each day in Glasgow, and that reshaping will allow TVA to make more of our energy with lower cost, and much more environmentally sustainable, energy sources. In the long run, we will all benefit from a reduction in the construction of new generation facilities, and we will be properly positioned to maximize our utilization of renewable energy resources. This concept begins in Glasgow, but we hope it will quickly spread to other TVA utilities. As that happens, each community's environmental footprint will shrink and we will all leave the region in better shape than we found it.